One of my consulting clients has a Michigan based, healthy living business. 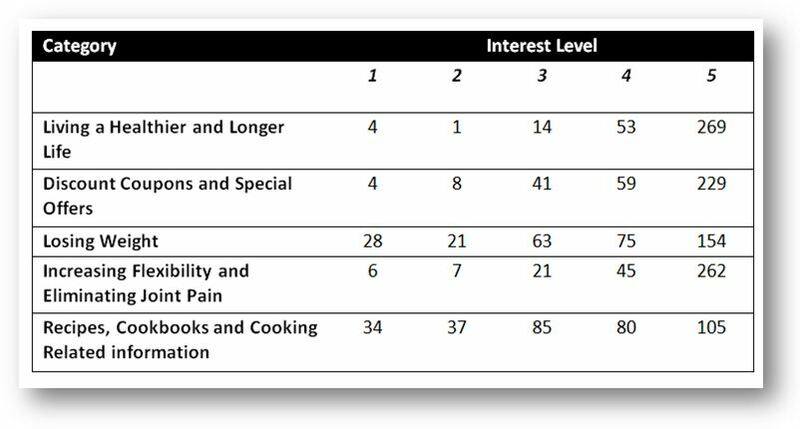 We used the approach I outlined previously to survey his customers about their interest level in 5 different product categories he wants to develop. The owner was very pleased with the initial results. In todays post in want to share the results the results. First of all, here is a summary of how we prepared for the survey. Create survey form. Use Google Docs for the survey form because it is one of the fastest and easiest to implement. Survey question: “Which of these are you interested in most”? There are 5 possible answers to the question, we asked customers to rank their level of interest in each category, from a range of 1-5, 1 being little or no interest and 5 being high interest. We looked for patterns in the data by sorting the data in different ways to see any patterns emerge. Since our detailed results contained each respondent’s ‘vote’ so we noticed each was interested in multiple categories. There was strong interest in healthy living and living longer. Most had interest in saving money. Losing weight was not as much an issue as expected. Interest in join health was more than expected. And we knew there is interest in recipes and cookbooks, but people seem more interested in the other categories. Majority are interested in discounts and coupons. As you can see from the results, asking your customers what they are interested in is a very powerful tool to growing your business. 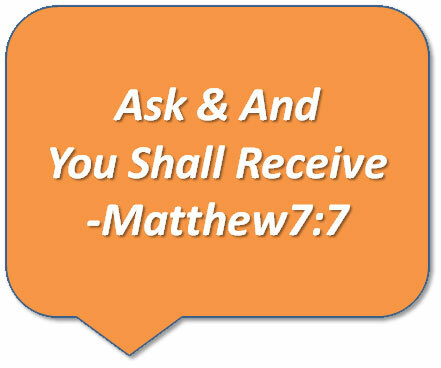 There are many other questions you can ask. Next steps are to drill a little deeper. My client didn’t expect one of the results of the survey and that is he now has a list of emails he can contact that are specifically interested in one topic more than another. He can now follow up and further define his product offering by subsequent surveys as well as target them for new promotions geared to their interests. 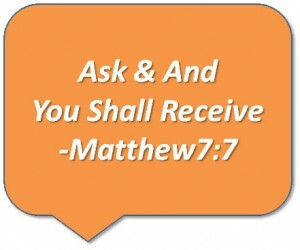 Ask and You Shall Recieve is indeed the most powerful question you can ask your customers. I will check in again in the future to share more results. you want congruence (hint: it’s the good feelings!). When installing WordPress, auto installer scripts such as Fantastico are a snap to use, but create security holes that leave your blog wide open to hackers. Here’s why you should never use Fantastico, SimpleScripts, and other auto installers with WordPress intallations. 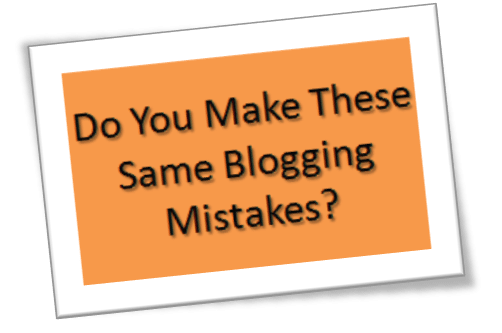 Do You Make These Same Blogging Mistakes? I found I am making at least six of the “dangerous blogging mistakes,” but I don’t think they’ll kill me! Mistake #1: Not understanding your audience – I am not as guilty of understanding it as I am of not targeting one. I will work on improving targeting. Mistake #3: Covering too many topics – I am guilty of this for sure. When I set out to take the 30 day blogging challenge I set 3 objectives improve my writing skills, prove I could do it and understand how to blog so I could teach others to do it for their small businesses and non-profits efficiently and effectively. 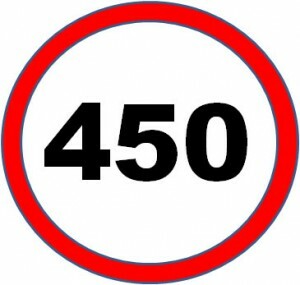 Mistake #4: Inconsistency – prior to the 30DC I did not blog at all, I now blog every day (at least for next 30 days ;-o) I have not settled into a consistent time of day, and that bothers me. I have been choosing a topic in the morning and thinking about it during the day and then writing about it later, doing some research throughout the day and collecting my thoughts. Then I write at night and stay up too late. This is affecting my morning tasks so I’ll have to keep working at it. Staying focused on a given topic and planning it out will really help. As the article suggests, you need a publishing routine! Mistake #7: Writing for myself instead of my audience. I am slightly guilty given my topic surfing! 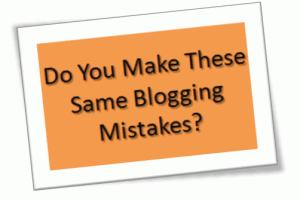 Mistake #16: Not promoting your blog content – Violation! I am in default here too! I am so new to blogging I want to settle in a little and get things tweaked. I am not in a race. I want to learn the process, prove I can do it (although I think I have proven that to myself already; o-) and then promote. I will think this over in the weeks to come. Mistake #20: Sacrificing keyword rich titles for clever titles – I have to admit I like playing with headlines and since I am not focused yet I am wavering. This will improve over time. Reading 21 Dangerous Blogging Mistakes (and How to Fix Them) has assisted me in evaluating my blogging and make some adjustments. One thing is certain; blogging is a skill that can be learned. In fact, I believe any skill can be learned over time. I will get better by blogging each day, and you will too! Go ahead and see how you are doing and check out the article and tell me which mistakes you are making. A detailed, step-by-step look at what it takes to get your very own website. This is the ultimate guide if you want to know how to get your own website. It’s now easy to publish your own magazine to a Worldwide readership and build a subscriber base. The author of this article has been doing just that since 2009 and explains how you can too. 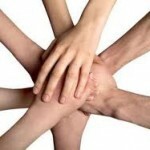 Make a list of local non-profits. Rank each of them according to your affinity to them. The ones with the highest ranking should be the ones you believe in most. Select the ones you like most. and write down the person in charge of publicity, make note if you know the contact or know someone who can introduce you to them. 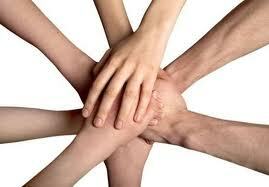 Identify their past events and promotions and with whom they partner. This will give you a good idea of what kinds of partnerships they are already open to, which could help you narrow your list based on what you are willing to do. Join their advisory board as a volunteer! Nothing works better to get to know a cause than getting involved. Meet with your Non-Profit to discuss their objectives and timeframes. Timing is everything. If you are launching a new prouct and they are expanding into a new area that might be the right opportunity to partner. Create a community cookbook. People love to cook and share the stories around their favorite family recipes. Invite local celebrities, chefs and local people to contribute recipes. Roast a local celebrity or community leader. Roasts can be a lot of fun if you have can generate media buzz if you choose the right person. Host a local chef cook-off. Again you can’t go wrong with anything food related, especially if you charity is food or hunger related like a food pantry or meals program. Can you think of a cause you could to get behind? It could benefit many people and could help your business grow too! Take action to get the ball rolling, it is never too late to get involved to help people in your own community! Why are you afraid about writing a book? Well, maybe YOU aren’t, but many others still hesitate at the thought of writing a book. Here’s why. A well thought-out and executed product funnel can make the difference between minor and major success with your online business. If your small business uses shared hosting (like GoDaddy.com) to host your email you are at risk of being flagged as a SPAMMER! You might not spend time in the slammer but your email certainly might! We’ve come to rely on email, and don’t give it a second thought when we hit the send button. We expect the email to get delivered, but sometimes it doesn’t. Your Mail Server Has Been Blacklisted! Have you ever received an embarrassing phone call from your best customer asking where is that proposal they need for the meeting today? Your email server may be blacklisted and your email is in SPAM Jail, worse you may not even know it! Or, when your purchase order never reached your vendor and you can’t ship your customers’ order on time and you have to swallow overnight shipping? According to M86 Security Labs, a global team of security experts, SPAM now accounts for 75.5 percent of the world’s email volume. Internet Service Providers (ISP) and IT departments use technology to determine the sender reputation of each email sender. This allows them to redirect and hopefully sanitize malicious email so it never reaches end users. 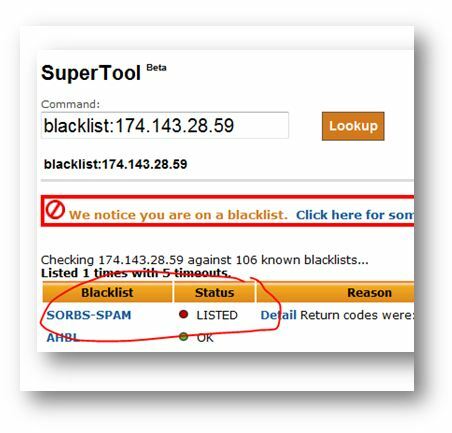 There are (approx) 106 known blacklist databases that exist to help combat the SPAM problem. They provide a service ISPs and IT departments rely on to determine send reputation. Additionally, there are other services, organizations, and technology vendors that fight the SPAM and MALWARE war every day. When an ISP encounters a threat they report the sender’s IP address to the blacklist databases providers who mark that IP address as a known spammer. You May Be Guilty by Association! When you use shared hosting you are share the same computer and IP address with hundreds or maybe even thousands of other computer users. 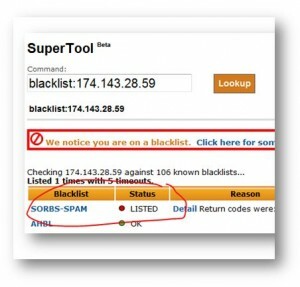 If your ‘neighbor’ sends and email that gets blacklisted you get blacklisted too! Your neighbor might not be a spammer but getting infected with a virus can have the same affect. For that matter, you could cause hurt your neighbor in the same way! Use a free service like MXToolbox.com to monitor and alert you to any problems it detects. Always use best practices for email marketing. Never send spam or bulk emails, or collect emails using harvesting programs. Keep your computers and your network secure and up to date. Use anti-virus and malware software to protect your computers from hackers. If you have a local network get regular vulnerability scans. Never use a free service like Yahoo! or Hotmail. This makes your business look like a fly-by-night operation. Even when you’re small you want to portray the most professional and competent image possible with your own branded email address. Host you email with Google Apps. For small operations on a tight budget you should try email hosting with Google Apps. There is free and paid version (which is very affordable) and is easy to setup. Plus you don’t have to move your webhosting; you just need to make some small adjustments on your shared hosting admin console. Google apps also helps to control spam because of their advanced spam filtering technology they use for Gmail.com. MX Toolbox – offers free monitoring as well as a variety of paid services to protect your email, your network and your reputation. Photographing events can be a challenge. It can be difficult to get great photos with crowds of people in constant motion. This article provides 5 event photography tips to overcome the challenge. ÎValueâ is a term hardly given thought to. limited to front-line staff, who appears to be the only delivery team. Its effects, could make the difference.